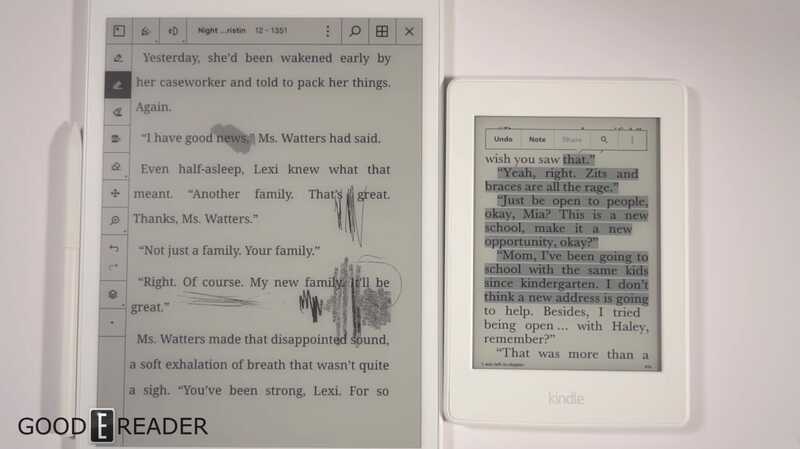 The Amazon Kindle Paperwhite is the most popular e-reader in the world and today we compare it with the new Remarkable. In this comparison video we take a look at the e-book experience and what you can expect. The Kindle reads their own proprietary format and the Remarkable can read PDF and EPUB. We are primarily evaluating page turn speed, fonts, font sizes, and margins. If you are looking to read ebooks on either of these two devices and are unsure how they perform in real world conditions, this is the video for you! One of the big advantages of the Remarkable is that you can draw on EPUB eBooks. There are only three dedicated note taking readers that can actually do this, and Remarkable does it best. The main e-reading app has native compatibility with all of the same features you edit a PDF file with. The Kindle on the other hand can also take notes, highlights and annotations but you need to use the built in keyboard, since this e-reader does not have a stylus layer. The Kindle also has an advantage of having GoodReads and Overdrive library book support. How is the contrast on the two devices? What is the brightness setting on the paperwhite? Thanks!